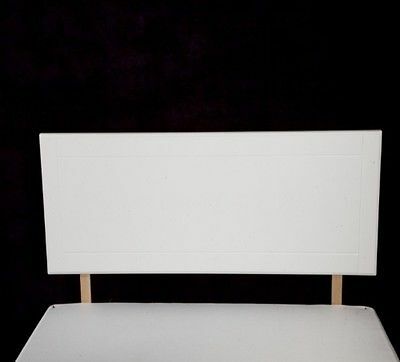 Home FAQ's Feedback Bookmark Us Contact Us Browse our Store 3ft Single Size Headboard - White Description These beautiful headboards are manufactured in our UK factory and will attach to any divan bed base of the same size. They are made from MDF panels which are routed, profiled and covered with a hard wearing, wipe clean finish which is pressed to the panel under vacuum. The edges on this product are better than laminates, as they are more rounded, without sharp corners, and have no joints. Panel Thickness: 18 mm. (excluding legs). Finish: Smooth wooden wipe-clean finish panel with grooved design.